Khunu Lama Tenzin Gyaltsen Rinpoche, India, circa 1977. Photo courtesy of Lama Yeshe Wisdom Archive. Beth Halford, an FPMT student who was staying at Root Institute in Bodhgaya, India, in March 2015, was fortunate to interview Ven. 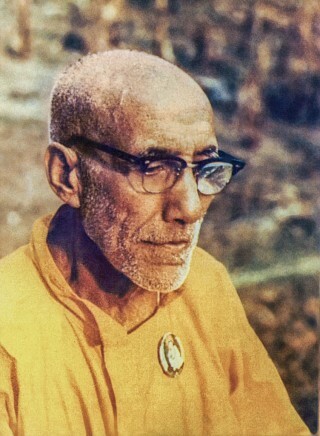 Thubten Tsewang, known as Baling Lama, a disciple of and attendant to the Indian Buddhist master Khunu Lama Tenzin Gyaltsen Rinpoche (1894-1977). Baling Lama is now 80 years old. He worked in radio broadcasting in Ladakh, India, before meeting Khunu Lama in 1954. After meeting Khunu Lama, Baling Lama ordained and became a devoted disciple for six years. He then became Khunu Lama’s attendant in 1960. Here is the story of Khunu Lama as told by Baling Lama. … Once Khunu Lama felt he had enough of a general education to effectively learn Dharma, he traveled to Tibet, spending many years going between Tashi Lhunpo in Shigatse and the Kham region, and also spending some time in Lhasa. In Tibet, he received teachings and initiations from many great teachers of the time, becoming a highly respected student and teacher, perfecting his Tibetan language skills and becoming a scholar of Dharma texts. “Khunu Lama met and received teachings from many highly realized and respected lamas, but he never mentioned that he had taken any as his root guru nor did he talk about his gurus in general,” Baling Lama said. He did, however, encourage others to choose a root guru carefully, in order to ensure the teacher was someone who had cultivated true bodhichitta in his heart. Khunu Lama would make it clear that the teacher didn’t have to be a well-known lama, but it was the feeling in a teacher’s heart that mattered. Khunu Lama’s example of not talking about his gurus is a strong teaching on the importance of not sharing certain aspects of practice and experiences with Dharma. “This avoids making something that should be very special into a worldly thing,” Baling Lama explained.